The Fabric House fabric store in Nashville, TN, serving Louisville, KY, would like to share the news – Two of our largest cut-yardage companies have merged! 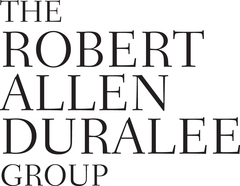 I am pleased to share the exciting news that The Robert Allen Group and Duralee Fabrics, Ltd have merged and are now both divisions of The Robert Allen Duralee Group (or The RAD Group). Interior design is a creative, stimulating, and ever-evolving industry. Suppliers to the interior design industry are tasked with the mission to meet and exceed your expectations for innovative, beautiful products while providing you with exceptional service. This merger will help our combined teams meet this important objective and elevate our industry capabilities to new heights. The Robert Allen Duralee Group is now an unparalleled resource for luxury home décor. I also want to introduce myself. I am a long-time Duralee executive with over 35 years of experience in the home furnishings industry, and I have been named CEO of The Robert Allen Duralee Group. I am pleased to lead an executive team, comprised of talented leaders from both companies, which boasts a collective experience of over 150 years in the decorative furnishings arena. The Robert Allen Duralee Group is now one of largest companies in the industry. We have an expansive product line—more than 45,000 SKUs of fabric, trim, decorative hardware and furniture within multiple brands to cover virtually any design style. At the same time, The Robert Allen Duralee Group honors the family legacies and experiences of Duralee and Robert Allen through the distinctive capabilities and product offerings from each company. Both The Robert Allen Group and Duralee will continue to operate as separate divisions and will continue to sell products unique to their respective brands. This is an exciting time for The Robert Allen Duralee Group and our industry. As we embark on this new chapter, we look forward to continuing to provide you with outstanding products and customer service and are enthusiastic about finding new and unique ways to meet your design needs. The Robert Allen Duralee Group is committed to a client-centric culture and will be updating you on the progress of our merger as often as necessary. Any merger of this size is bound to have a few hiccups. You have my personal assurance that we will do everything we can to make this integration as seamless as possible. Our team of over 500 dedicated employees is united in the desire to deliver superior service. I look forward to what the future holds and will be communicating with you as we achieve our integration milestones.